When I launched Hypothyroid Mom in October 2012, my dream was to reach 250 followers. Little did I know that 4 years later, this blog would have over ONE MILLION followers, yes I said one million. I will never forget the people who first followed my Hypothyroid Mom Facebook Page when I only had 40 or so followers. Whenever I see their profile pictures pop up when they comment on a post on my page, I smile. All these years later and they are still here. How blessed I feel. Karen is one of those early followers and I’m so proud to have her writing here today. I guess I always knew something was a little off balance…not quite right. There were migraines, stomach upsets, acne, bronchitis, heavy and long periods. Not to mention the whooping cough at six months old, which seemed to last an eternity according to my Mom. Then began the cycle of weight gain and loss, the depression, anxiety, and the recurring (and eventually) constant pain. I just never connected the random symptoms. They really didn’t connect…until they really did! As a fellow human with a chronic illness you too may not yet have connected the long line of dots. But almost 100% of the time the trail of symptoms and random illnesses will be a better lead than the one that Hansel and Gretel left, when they went to the Gingerbread House, just not quite as obvious at times. Of course it wasn’t until 2011 when I became so incredibly sick that working was no longer a viable option that I began to research what in the hell was actually going on and started to retrace the trail. At the onset of my severe symptoms and into 2013, my medical “help” was really not all that helpful. I had a rheumatologist that prescribed Plaquenil for what she described as “an RA type illness” and gave no clear diagnosis. It turned out later that I had Lupus. My family doctor laughed at me when I asked him to test my thyroid and told me to bathe if showers were tiring and the initial Respirologist that I was referred to sexually abused me on three separate occasions…THREE. NONE of these people were held to task for their behaviour by the relevant medical body and I subsequently spent two years of additional stress years undergoing questions and lies during the complaints process. Head down the line to 2014 and my insurer abruptly cut me off. I was told that I no longer fit the description of disabled, even though they had a trunk of doctor’s notes and other medical information pertaining to my situation. The very same insurer was intentionally harassing and failing to collect my necessary information. I sued successfully (another eight months of stress and the loss of two months of payments which I now owed my lawyer). If I had known then (2011, and possibly earlier) what I am absolutely certain of now, my journey with chronic illness would have been so, so different. That is why in 2015 I actually knuckled down and…well no, that’s kind of a half truth, lol…between the late months of 2014 and the latter months of 2016, I compiled a lot of my personal medical history, thoughts, journal entries, articles for various social sites and other information, which I then decided to turn into a book, CHRONIC: A Comprehensive Guide to Thriving While Living with a Chronic Illness by Erica Worth. I used a pen name on this project because I wanted to separate this from my writing as a music journalist. To make it more “serious” if you will. I took a lot of breaks and quit totally on more than one occasion, sometimes through frustration, others because of pain and poor concentration. But it was SO important that I needed to complete it and it would have been worth 150 times the effort that I put in. 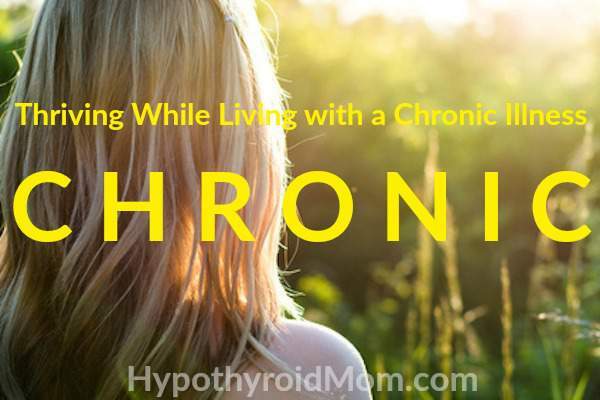 I still live with Hashimoto’s Hypothyroidism, Lupus, PCOS, RA, Cyclical Cushing’s Syndrome (Adrenal illness), Inflammatory Bowel Disease, and Chronic Allergic Asthma…I don’t think I have missed anything. My point here is that everything I do now still takes a measured amount of planning and often much caution, but with the information that I learned, gathered and realized, I manage a life that really is well worth living. Learning, digesting, sharing, and discussing information on the Hypothyroid Mom Facebook Page that Dana created has absolutely changed my life and the lives of those close to me. I am once again able to live my life to the best of my ability. I have a decent medical team right now but that came to me the hard way. I had to fight some doctors and more fell by the wayside. There was time wasted which could have been used so very differently. I lost “friends” who just couldn’t be bothered with someone who “couldn’t make it” or “didn’t feel well.” I don’t miss them either. It showed them to me in their true light. We are all so uniquely different. Not one of us has identical symptoms, timelines, or levels of pain. On many levels, however, we are all so very very similar. We are struggle with a chronic illness that no one “sees”. Our symptoms are not all “in our heads” as many of our doctors would have us believe. Our symptoms are REAL and thanks to finding one another we know now that we are not alone. Karen Graham HNC aka Erica Worth is an Esthetician and music journalist at headbangerwoman.com Born and raised in England in the 1970’s, Karen immigrated to Canada in her early thirties with her husband and daughter. She breeds Bantam Bulldogs. Went to Amazon to find a copy of the book only to find the price tag is $3,790.99. Guess this wont be on my reading list, though I would love to have read it. wow Susi. Thanks for the heads up. I’ll let the author know to figure out what is going on with Amazon.